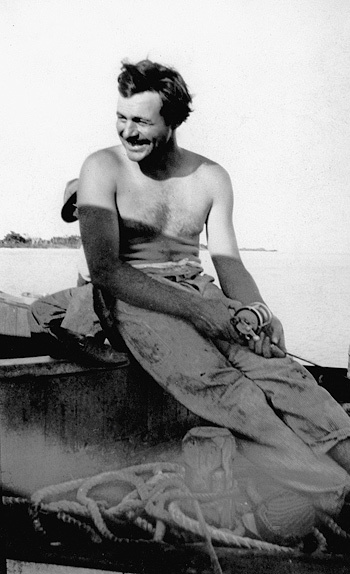 Ernest Hemingway fishing in Key West, 1928. There are probably other writers that are as endlessly quotable as Ernest Hemingway, but he is certainly one of the most quotable authors ever. Just like his writing, many of his quotes are direct, to the point, and hide a lot of depth and meaning in very few words. In my late 20s especially, I was obsessed with Hemingway’s books and life, and he is still one of my favourite authors. Even though his celebrity status seems to emphasize his “macho-ness” (all that hunting and fishing and drinking), I never got that from his books. Men and women, and the world they live in, are complex and nuanced in his writing, and there is not a lot of testosterone-charged posturing and posing. As a writer, what I mainly appreciate about Hemingway is his style: that controlled and sparse, but not at all barren, way of writing that dispenses with anything that is superfluous. It’s so easy to write too much when you’re working on a book or a story, especially these days when most of us write on computers, rather than by hand or on a mechanical typewriter. Many years ago when word processors had just started taking over the world from the typewriters, a publisher-friend told me that the manuscripts he received were getting longer and wordier every year. When it’s easy to write the words, it is also easy to produce too many of them, and not think properly of what words to choose, and whether all of those words are actually needed. This was obviously a writer who would have ruled Twitter, if he had wanted to do so. If you’re looking for a great biography, Carlos Baker’s “Ernest Hemingway: A Life Story” is excellent.